A failing school for pupils with behavioural problems in North Yorkshire has been renamed in a bid to give it a fresh start. Foremost School near Harrogate, now Forest Moor School, has been turned from a boarding school to a mixed day school. 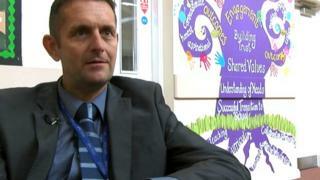 Head teacher Simon Ashby said the new name was a "small but important statement". From 3 November the school hopes to also take in younger pupils. Mr Ashby said a new uniform would be introduced and the "look and feel" of the building would be changed. Foremost School opened in 2012 to cater for boys who were removed from mainstream education because of difficult behaviour. In 2013 it was placed in special measures by Ofsted and there were 67 reports of assaults on teachers and carers over an 18-month period. North Yorkshire County Council turned Foremost into a special co-educational day school after it could not find a suitable independent provider. Mr Ashby became the head teacher in September after being an advisor to the school for 18 months. He said the school had had a "difficult past" and was now working on an improvement plan to get out of special measures by Easter. "We will have a new style in time for the new intake of children in November, supporting children with special educational needs back into mainstream education," he said. The school expects the new intake to include girls and younger children, meaning the school will effectively more than double, from 12 pupils to 30.